What explains the current deficit mania in Washington? 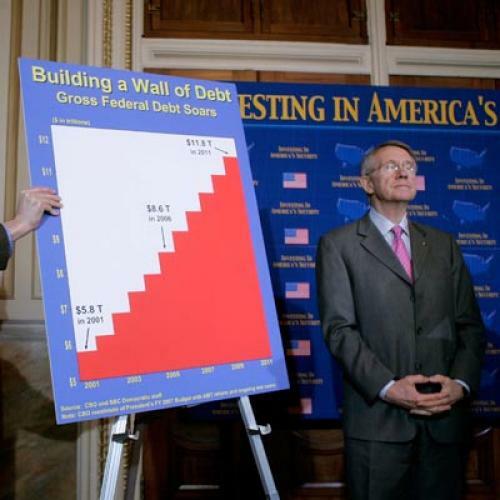 From the Ryan plan, to the Obama plan, to the Gang of Six (now five), deficit mania has officially taken over Washington. Both Republicans and Democrats, while they have different preferred approaches, are single-mindedly focused on cutting budget deficits and relieving the long-term debt situation of the country. Yet unemployment remains at 9 percent and the modest economic recovery that’s underway has shown signs of sputtering. What explains this dramatic disjuncture? The simplest explanation for Washington’s monomaniacal focus on the deficit would be that politicians are responding to a shift in priorities among voters. The electorate, in other words, is now more worried about the budget deficit than the economy, so politicians have shifted their focus accordingly. But that explanation is simply not borne out by the facts. While voters’ concern for the deficit has increased this year, it still lags far behind their concern for the economy and jobs: In a recent CBS/New York Times poll, 39 percent of people thought the economy/jobs was the most important issue facing the country, compared to just 15 percent who thought the deficit/debt was the top issue. Of course, it’s possible that voters believe cutting the deficit is the most effective route to job growth, an argument Republicans have repeatedly made. If that is the case, many of those who prioritize jobs and the economy could, in a policy sense, be demanding that politicians take action on deficit reduction. In this scenario, politicians would be responding to an implicit sentiment among voters, but this also happens to fail the empirical test. In the most recent Pew poll, just 18 percent of people believed cutting spending to reduce the deficit would help the job situation, compared to 34 percent who believed cutting spending would hurt the job situation and 41 percent who believed there wouldn’t be much of an effect either way. Whatever else the public may believe about deficit reduction, they clearly don’t see it as a tonic for jobs. A final possibility within the “responsive politicians” category of explanations for the current deficit mania is that voters, while perhaps not prioritizing deficit reduction, are particularly likely to punish politicians who do not take action on the issue. That is, even though deficit reduction is not the top concern for voters, nor is viewed as an effective economic remedy, voters will nonetheless turn against politicians who fail to make progress in this area. But this appears to get things backwards, especially when it comes to the incentives facing incumbent politicians. In reality, countless historical examples and empirical studies suggest that the surest route to getting booted out of office is poor economic performance—and this is the case regardless of whether politicians make progress on the deficit. Conversely, if the economy performs well, but little progress is made on the deficit, the incumbent party is still likely to benefit. But if Washington’s deficit obsession is not simply a product of politicians responding to a shift in the public’s mood, where does it come from? The likeliest alternative is that, as political scientists Lawrence Jacobs and Robert Shapiro argue in their influential book, Politicians Don’t Pander, elected officials don’t so much seek to know public opinion in order to follow it, but rather so they can manipulate it to support their agenda and minimize any electoral damage that might result. This clearly fits the way Republicans are handling the deficit issue: Cutting spending on government programs is at the top of their policy agenda, so it follows that they wish to keep the political and media conversation focused as much as possible on deficits. Over time, they hope the incessant hysteria will move public opinion to their side, allowing them to pass more and more of their preferred legislation. Moreover, they are betting that their unresponsiveness to the jobs issue will not hurt them because the media will mostly cover the endless battles over deficits and spending, creating a news vacuum where the public is likely, lacking other information, to blame the party that holds the presidency for inaction on jobs. Democratic complicity in today’s deficit-obsessed political climate is less easy to understand. Democrats, one might think, would place the jobs issue at the top of their agenda and exploit the clear public opinion preference for jobs to move their policies. But the assumption that jobs tops the agenda of all Democratic politicians is likely not warranted. There is a very significant section of the Democratic Party, including many moderates but also some liberals, that is not convinced by the standard Keynesian argument that deficits, even at their current levels or higher, are not a problem in the short run, while weak demand and slow job growth definitely are. These Democrats appear to be more impressed by arguments, retailed by the Bowles-Simpson Commission, the Committee for a Responsible Federal Budget, and a veritable army of editorial writers and pundits, that the country’s deficit and long-term debt problem is so severe that an immediate agreement to tackle the problem is necessary. Lacking an agreement on the debt, the argument runs, the U.S. will lose the confidence of its creditors and soon become an unstable, impoverished country. By this hysterical logic, an agreement on debt becomes far more urgent than dealing with the jobs situation. Why a sizable part of the Democratic Party would buy into this improbable argument is an interesting question. It is likely that, lacking any clear economic philosophy of their own, many Democrats are easily swayed by elite media pressure and bogus economic arguments that rely on “common sense” notions—debt is bad, Americans are tightening their belts and so should the federal government, etc.—rather than facts and logic. Democrats may also hope that, by raising the salience of the debt issue, they will earn points with the public for taking a “responsible” approach. It’s possible, of course, that this strategy will work. But given the well-known tendency of voters to focus most on concrete economic performance indicators like jobs, history suggests it will not. In the end, many in Congress may regret—and the country may too—that they didn’t do more of what politicians are assumed to do but frequently don’t: pander to public opinion. Ruy Teixeirais a Senior Fellow at the Center for American Progress Action Fund.